Jumna wants to show us life for her in Ramallah and outside. 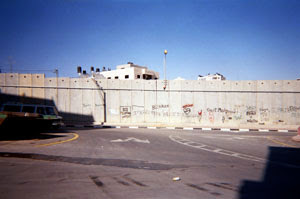 This is the wall, that blocked a main road. You used to be able to go straight on this road. Her family now lives on the other side of the wall, and she has a difficult time getting there. The house that you see on the other side of the wall is her families home. This is where her parents live. She used to visit them at least once a week now if she is lucky, she can see them once a month. 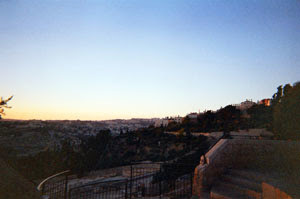 This is a view of Jerusalem. She loves Jerusalem and it is one of her favorite cities. 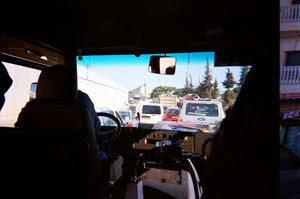 Jumna also took a photograph of the traffic back up at the checkpoint in Ramallah from her car. 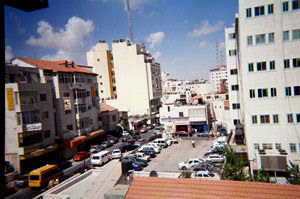 This is a view from her office where she works in Ramallah.